The Beatles are streaming the first recorded take of “Lucy In The Sky With Diamonds” ahead of the May 26 release of a series of reissues of “Sgt. Pepper’s Lonely Hearts Club Band” in sync with the landmark album’s 50th anniversary. 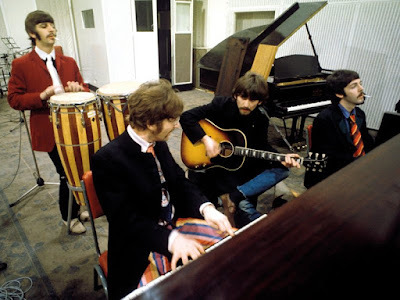 Captured in session at London’s Abbey Road Studios on February 28, 1967, the audio begins with some instrument noodling and chattering amongst the group before the tune opens with its iconic organ riff. The early “Lucy” session follows an unreleased outtake of the title track as the latest preview to the “Sgt. Pepper’s” reissues. The project will be available as CD, 2CD, 2LP, 6-disc Super Deluxe Edition and digital packages, all featuring a new stereo mix of the landmark album by Giles Martin and Sam Okell following the original work by the legendary George Martin. Full track lists for each version can be seen here.